After the Giants game, we decided to stay in San Francisco to visit the city. It is a nice town to discover. We first walked the entire fisherman’s wharf: a long area located on the waterfront of San Francisco. It was first use as a port for fisherman and then as a military port during World War 2. From the Wharf, we could observe the famous Alcatraz Jail (located on an island). Sadly, the next available tour was on September first so we had to skip! 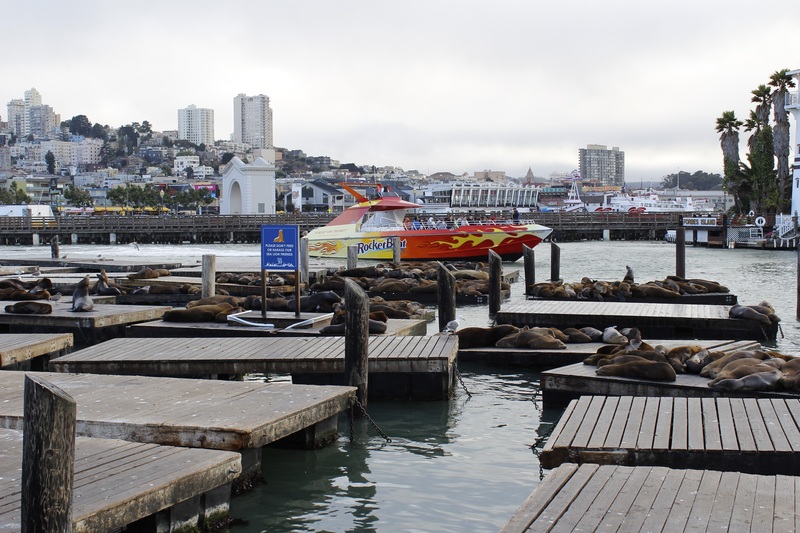 We continued our walk towards the famous pier where you can observer sea lions. They are present yearlong sleeping and barking on floating docks built by the city. They used to all leave for the south during winter time but some decided to stay year long. 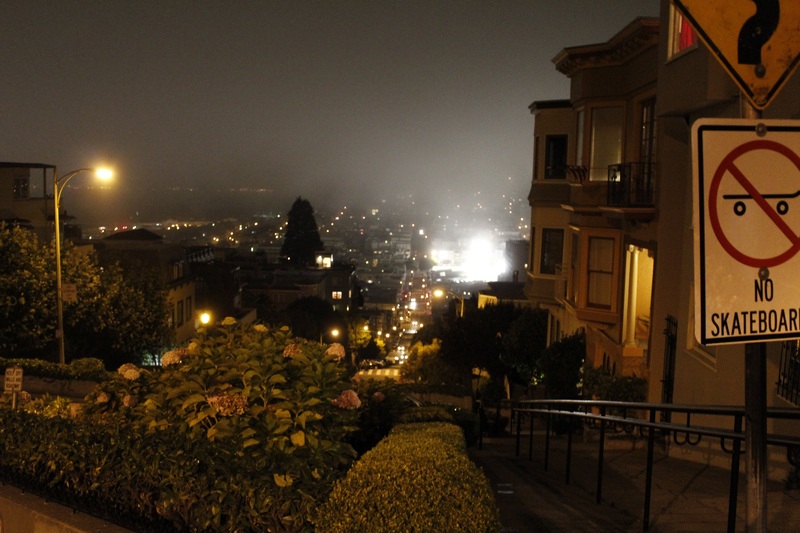 After sunset, we decided to keep visiting towards Lombard Street. One block of this street is particular: it consists of 8 hairpin turns extremely narrow that gives to the street the tittle of crookest street in the world! It was a good idea to get there at night: almost no tourists are in the area and we still get a good view! We came back the next day to continue our visit of San Francisco. 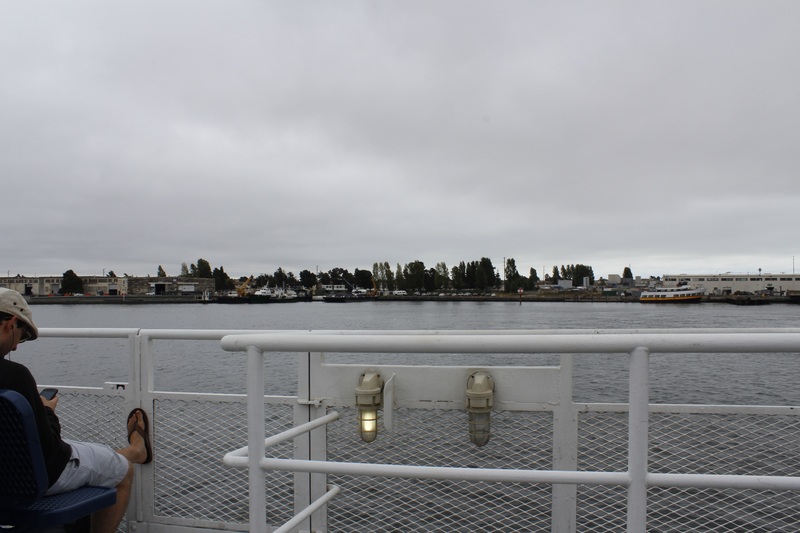 To skip the toll and the traffic jams for the bridge (all of them) we took the ferry in from Alameda. Ferries are very popular in San Francisco and are used daily by workers. 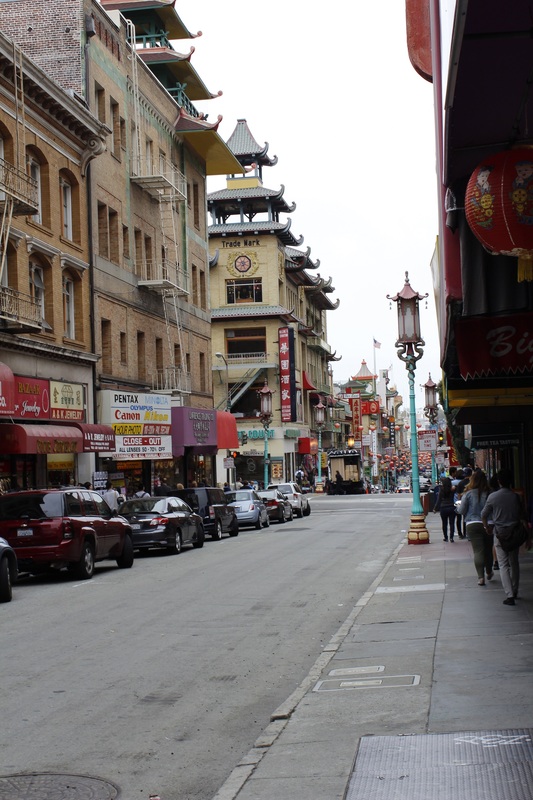 We followed an itinerary that brought us in San Francisco’s Chinatown (the biggest outside of Asia). We walk through small Alleys where Sun Yat Sen prepared a coup against the Chinese state or another alley well known by Jack Kerouac. 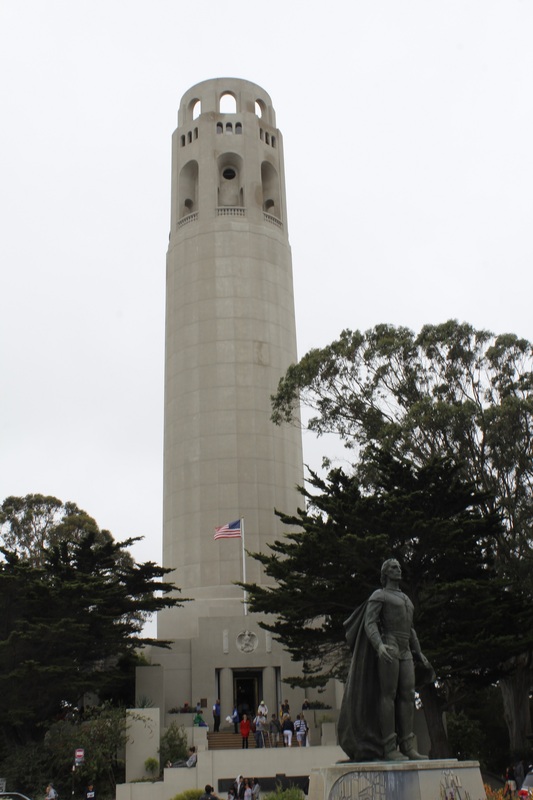 We stop by a famous Italian grocery to pick up a homemade salami sandwich and we head toward Coit tower. The uphill walk towards the tower is very hard. 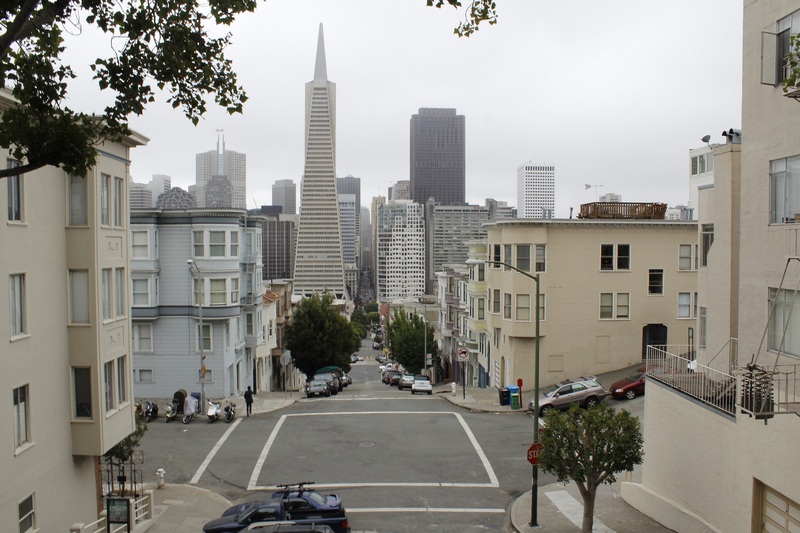 When we think about San Francisco, we think about all those hills going up and down. We needed some courage to get there on foot since the tower is located at one of the city’s highest points. Although, when we arrived up there on Telegraph hill, we could enjoy the great view of the city and our well-deserved Italian sandwich! Next, we took the (electric) bus to cross from east to west to get to the Golden Gate Park. 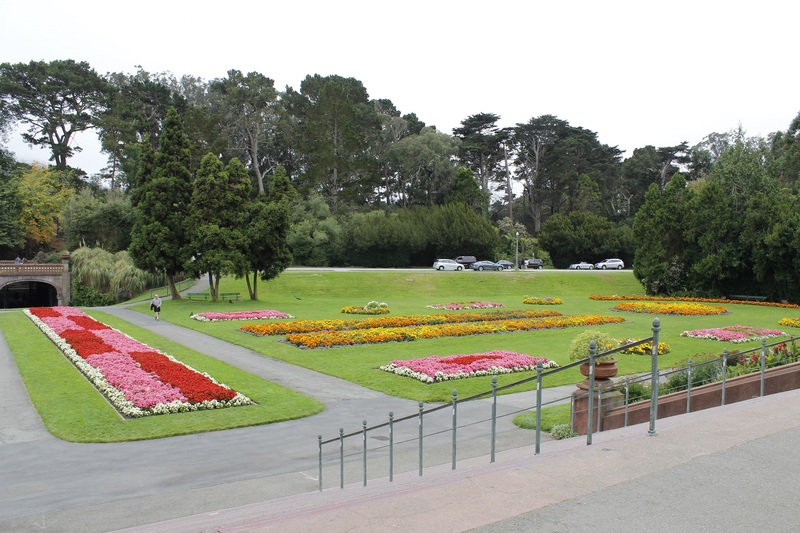 This large urban park contains many attractions: the California academy of science, a Japanese tea garden and an AIDS monument. 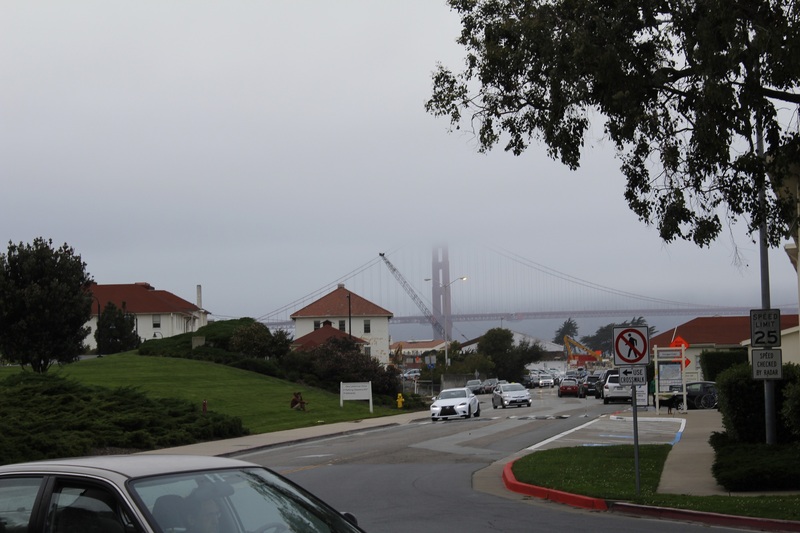 From this park, we walked all the way to the water front to get a good view of the Golden Gate Bridge. We were unlucky on that day since the weather was foggy and grey. We couldn’t get a really nice view of the bridge but we still got to see it! Also the walk towards the waterfront was very long across residential neighborhood. I have to admit that it is the second time I’m visiting San Francisco and it is the second time I underestimate the distances between two points! We would recommend that, if you visit San Francisco, you bring good walking shoes! We headed back slowly to the ferry building with great memories of San Francisco and very sore legs! The next day, we headed to a local Laundromat (we were running low on clean socks!). We then got ready for our next game at O.co Coliseum in Oakland. During the past weeks, we got to know a few Athletics fans via social Medias that were really interested in our project. We were very excited to meet them in the bleachers section. 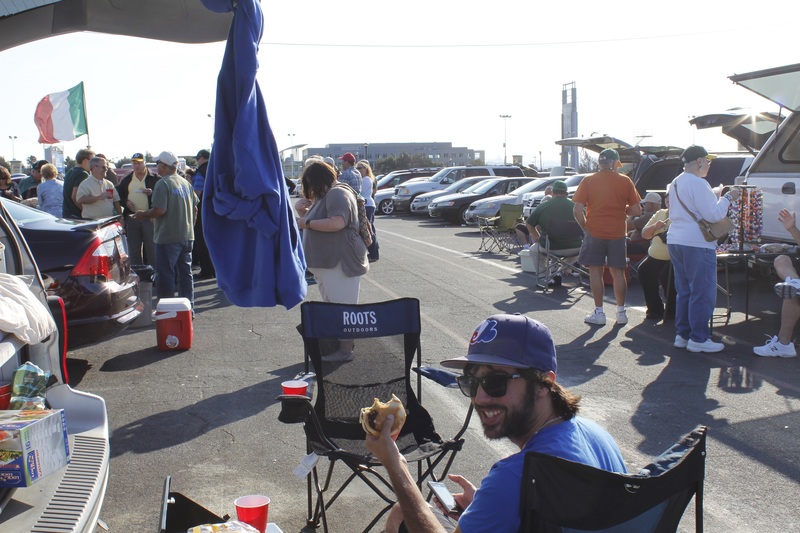 Before heading into the ballpark, we enjoyed the famous Oakland tailgating scene! We always appreciate a good tailgate party especially since it was free parking Tuesday! The atmosphere was really nice out there and we had a nice sunny afternoon to make it perfect. We parked next to an Italian association that came to the game on that day: they had plenty of food! A lot of fans noticed our car with the writings of our journey (we write down every ballpark that we visited with the date on both side of the car) and they came to talk with us! People really love what we are doing. People in Oakland understand our situation for two particular reasons. First, a lot of fans in Oakland are Raiders fans (NFL team). This team, which came to Oakland in 1960, left for Los Angeles in 1981 before coming back to Oakland in 1994. So they know the feeling of losing a team. 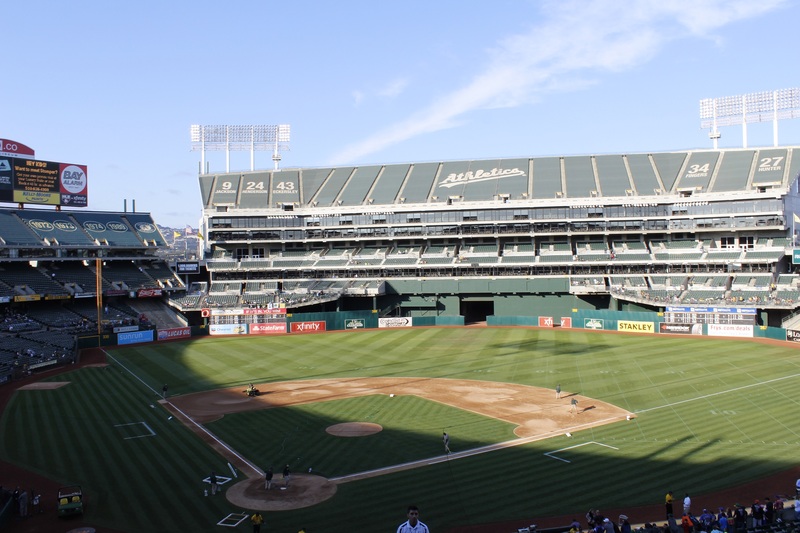 Secondly, there are a lot of rumors that are sending the Oakland A’s to San Jose (1 hour drive down south) where they would get a new ballpark. This is why so many fans sympathized to our cause and our project. After eating our veggie burgers (we are having difficulties to get an equilibrate diet since we left! 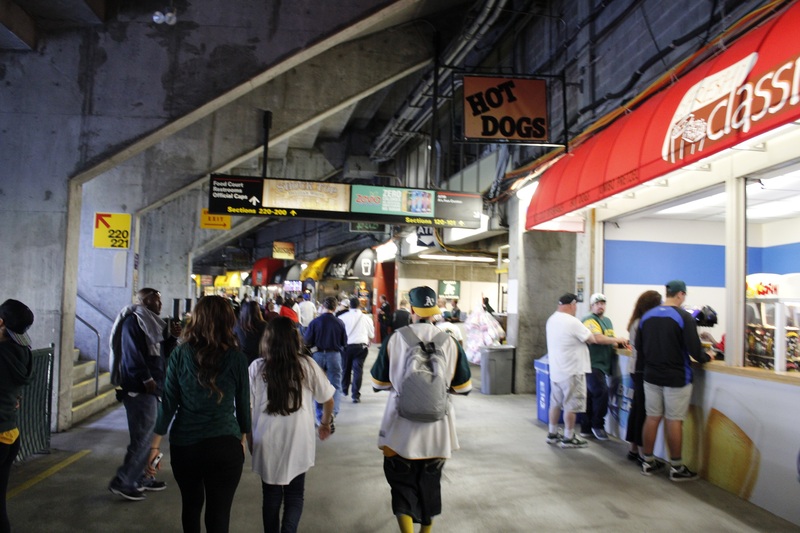 ), we headed into O.co Coliseum. This ballpark was built in 1966. 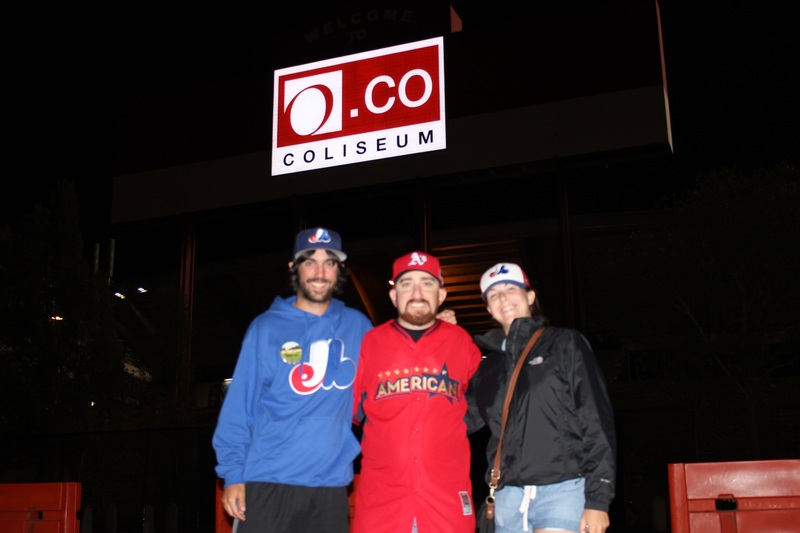 It is really in bad shape… one of the first comments Adry made was: we feel a little bit back at Stade Olympique. One of the big problems is the cohabitation of Baseball and Football. Almost every fan told us about the sadly famous mount Davis. Mount Davis is a giant seating section that was added by the raiders during the renovations of 1996. It blocks the view of the Oakland hills that the fans used to see behind center field. Go look for fun on the internet what was the view before mount Davis out there. This monstrosity closes almost completely the ballpark all the way around. We have to say we didn’t have the feeling to be in a ballpark out there. Also, walking around, we didn’t see a lot of attractions for the fans lying around: only a few games for the kids a nice bar\restaurant behind home plate inside the park. We got to see a fee plaques and pictures of important athletes in Raiders and Athletics history. Why were we so excited to visit this ballpark that is consider by many to be one of the worst ballpark in the league? Because of the fan base and the atmosphere! 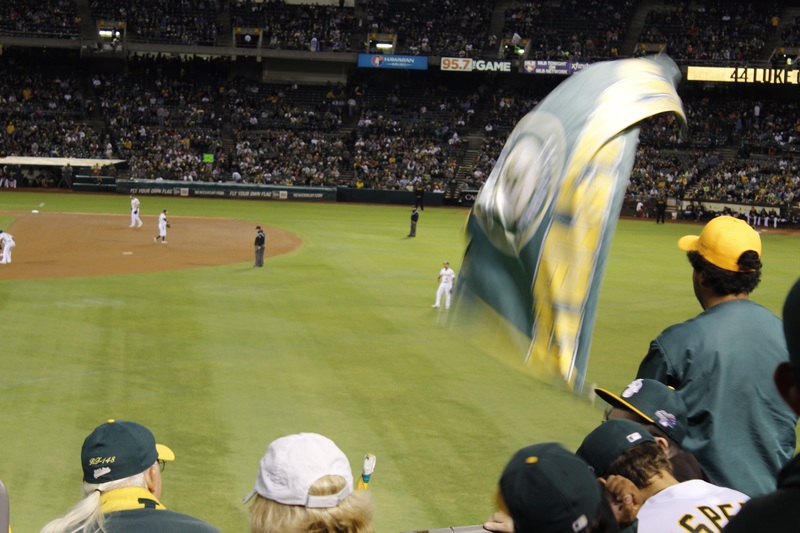 The Oakland A’s fans decided that they would make their own fan experience out there and more specifically in the bleachers. 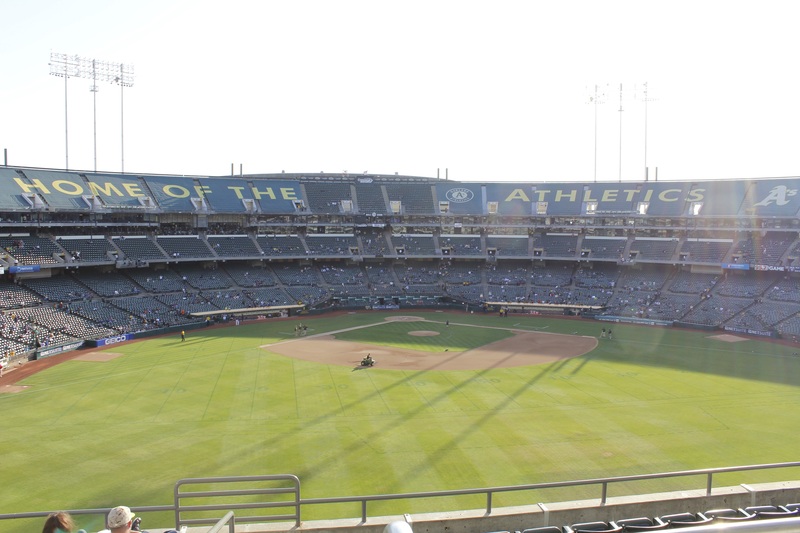 The bleachers at O.co are General admission seats (meaning you could sit anywhere in the bleachers with you ticket). You could easily spot those fans since they have big A’s flags in their hands and banners are hanging from the railing. You could go to two different spots: Right Field bleachers and left field bleachers. Both are very animated. We were meeting with people in the right field section. How can we describe: 1) Flags are waved when a player gets at bat 2) insults to the opposing team right field (except for a few players that have immunity!) 3) Special chants and dances for every A’s player 4) Throwing candies at fans in the section during breaks 5) drums and cowbells to follow the strike count… and we must be forgetting stuff! The most important thing is that all of this is done in such a friendly environment. The fans are always having a blast and they get to know each other like a family. They will be there winning or losing. Also, all of this is done in the respect of the players, the opposing team fans, the officials and the ballpark employees. Some soccer fans in Montreal could learn from these fans in Oakland! We got the chance to talk a little bit more with two fans: William and Bryan. 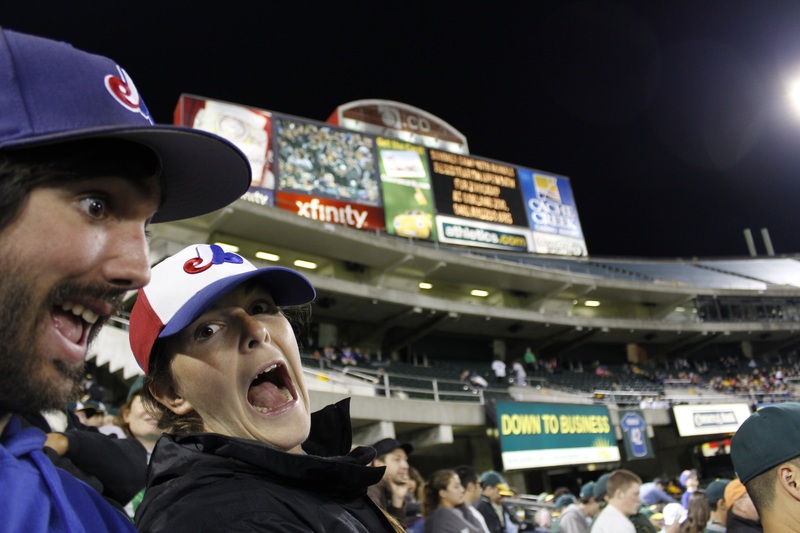 They are both huge A’s fans and they can both be found in the right field bleachers! 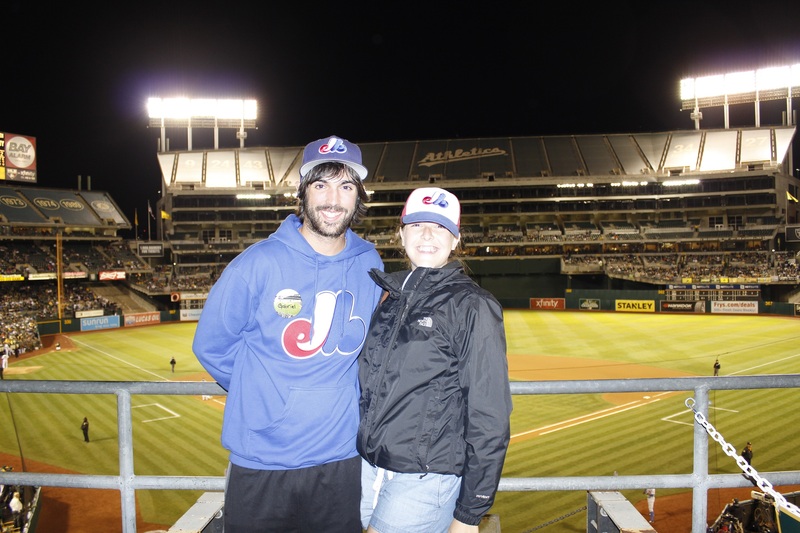 We talked about the possibility of the A’s moving to San Jose. Answers were mostly the same with the fans: they would stay faithful to their team but the fact that the team would be an hour away would make it difficult for these fans to attend as many games as they do today. Also, the team is associated with Oakland. It is part of the identity of the team. Would you still go see the Montreal Canadiens as much if they were moving to Gatineau? William also told us about the trade of the young Yoenis Cespedes for Jon Lester. The team is going all in for the post season since everyone is saying that the A’s won’t be able to offer Lester a long term contract at the end of the season. A lot of fans were mad when this trade happened because they were really getting attached to Cespedes. Also, the team seems to be struggling since he left: they were on a 5 game losing streak when we got there. With a very low payroll, the A’s are used to see players come and go. The good players are often leaving for teams that offers bigger contract. Even though, the team as known success recently with a playoff appearance last year and a really good record this year. The team can always be proud of their famous triple World Series wins in 1972, 1973 and 1974. Let’s talk baseball: like we said, the A’s were on a 5 game losing streak and they were battling the New York Mets. Scott Kazmir was the starting pitcher for the A’s and Dillon Gee was pitching for the Mets. In the 4th inning, Travis D’arnaud, the designated hitter, broke the ice with a solid solo home run and the Mets were in front 1-0. The A’s answered back right away: Stephen Vogt would hit a single, Derrick Norris a double, Josh Reddick would walk and the bases are now loaded! Vogt would come home on a sacrifice fly. A walk to Erick Soggard and the bases are loaded again! Coco crisp came to the plate and hit the ball deep in right field for a triple and he emptied the bases. A’s were In front 4-1. In the 7th inning, Scott Kazmir would be relieved and on a Anthony Decker’s double the Mets would get closer: 4-2. A’s would give us even more runs with a Josh Reddick’s home run with a men at first base: 6-2 A’s. Sean Doolittle would be coming to the mound in the 9th to finish that game. After giving a base hit to the first batter, we would get the next 3 to strikeout! A’s snap their losing streak with a 6-2 win. In the energy that followed the A’s win, we followed our new friends to the parking lot. After every game, they stay out there and chat about baseball and everything else until the cops kick them out! All of this stays really friendly and opened! We could say that their energy is contagious! While talking with a lot of fans, we realized that they were all really touched by our story. They had compassion for what happened to us in Montreal. More than that, they know that the team leaving Montreal is a possible scenario that could happen in Oakland. If their team would ever have to leave, those fans would be heartbroken. They all encouraged us to continue our trip and to never give up so we could get a team back to Montreal. We wished them all good luck heading into post season and we wished them to get soon enough a new ballpark independent of the Oakland Raiders! It is crazy to see how a fan base can get so intense around a team with ballpark difficulties and a really small payroll. 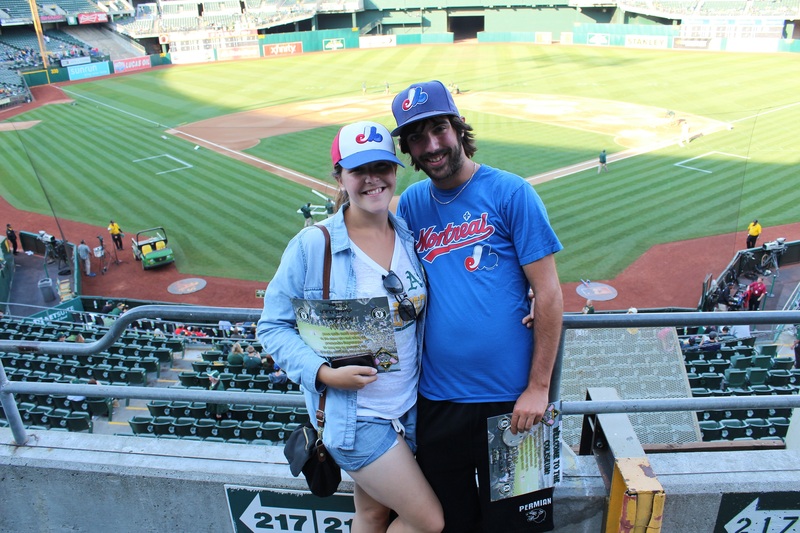 To see people like William that will travel to see the affiliates teams of the A’s (AAA, AA, A) and would end up to see more than 200 games a year is amazing. Or to see people like Bryan that are working so hard to show his pride for the team by now missing a home game in more than 160 games! What a pleasure to meet all of them and we really wish to have a fan base like this one when we will get baseball back to Montreal. Thanks a lot to Will for giving us Athletics t-shirts! We will wear them proudly! Thanks to Bryan for bringing us into his post-game selfie tradition: a picture taken after every A’s home wins since May! We will now take a few days to get to Seattle and Safeco Field. P.S. Did you know that the Athletics were having a Yoenis Cespedes t-shirt giveaway 2 days after he got traded to Boston! couldn’t see the picture but fans from Montreal are travelling through all the league and that is great! Hope you had fun in Philly!